So. MY LOVE FROM ANOTHER STAR. Where do I even begin?! MY LOVE FROM ANOTHER STAR (별에서 온 그대) is so shiny! Shiny, shiny, shiny. It's cracktastic sci-fi romance in the sense that the show has significant flaws, yet manages to entertain in a delightful way. Does it succeed despite the flaws? That'll depend on whether viewers are willing to overlook them. 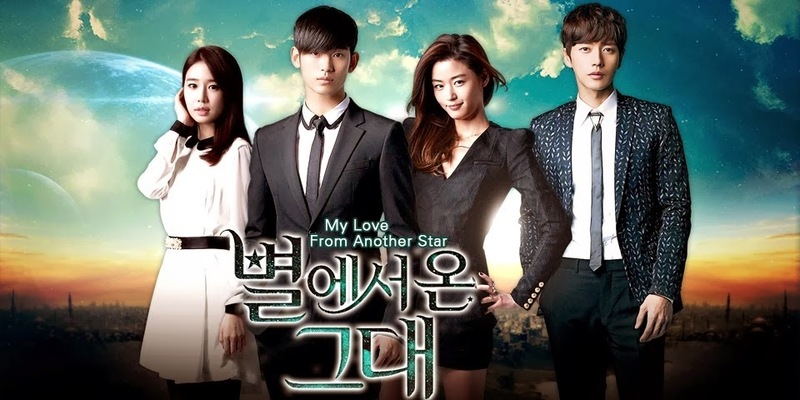 MY LOVE FROM ANOTHER STAR may also be the first show of its kind, or among the first (i.e., live action sci-fi romance soap opera). While the trope of an alien hero visiting Earth and falling in love with a human woman isn't new--in fact, it's been explored many times in SFR books--its interpretation in a visual medium is still pretty rare. I'm going to share my experience watching this twenty-one episode show. I'll provide general impressions and tags, but will avoid major spoilers. What is this this show, exactly? I've been a fan of Korean cinema for years (hello, OLDBOY, MY SASSY GIRL, and THE WEIRD THE BAD THE UGLY), but this is the first time I've dipped my toes into K-drama. I was really excited to watch MY LOVE FROM ANOTHER STAR ever since learning about it from issue #1306 of Entertainment Weekly. I had no idea what to expect or if it'd even turn out to be an SFR in terms of romance genre conventions--especially since various descriptors for the show were anything but. It's accurate to describe MY LOVE FROM ANOTHER STAR as a fantasy, comedy drama, romantic comedy, or a combination thereof because the premise and science fictional angle fall under the superhero category. I'm willing to bet many viewers of this show don't automatically equate superheroes with SF in the way they'd equate AVATAR or STAR TREK with SF. Superheroes can be fantasy or SF-based, but they're also kind of their own thing. Anyway, this being my first K-drama, I had a learning curve ahead of me, but as an adventurous viewer that aspect held appeal for me. I'm not a fan of American soaps, but I did watch Soñadoras back in '99 (without subtitles!). That show was loads of fun (for the record: my favorite character is Lucia--so adorkable! ), but given my predilection for SF/F, I didn't pursue any more telenovelas. …However, it is not really a Sci Fi show. The show seems to skew too much towards the off beat fantasy prevalent in K-dramas recently. To understand what this show is, we have to look at how the "Alien" is portrayed…. … The interesting factor of “My Love from the stars" is not that it is a fantasy with some Sci Fi coating. It is that it is similar to the modern vampire genre coming out of the U.S. I agree that MY LOVE FROM ANOTHER STAR is a blatant attempt to cash in on the vampire romance trend. Otherwise, why have an alien with a centuries-long lifespan? On the other hand, since I hadn't seen much of the show yet, I decided to keep an open mind. Would there be a significant amount of overlap with paranormal romance, or just a little? That last sentence intrigued me. What qualities make him seem atypical? Would I, an SFR fan, find the hero similar to those found in SFR books? I wonder if Do Min Joon seems "out of place" because he comes across not as a typical vampire, but as a mashup of Superman and Spock. Because IMHO he's totally a blend of those two iconic characters. So the question I continually asked myself while watching the show was this: is his character, while an attempt to appeal to vampire romance fans, crossing over into more truly speculative territory (albeit of the lite kind)? Now that I've seen the show in its entirety, I believe he did. Do Min Joon may seem "out of place with K-drama archetypes," but regular SFR readers will instantly recognize his "type." Plus, a number of sci-fi romances have featured PNR-SFR blends (e.g., vampire heroes in space). Again, not a new exploration, but it popped up in a new medium. The basic tags are alien-on-Earth and superhuman SF. Contemporary setting. Despite a reference to a wormhole, plausibility is definitely not a strong suit of MY LOVE FROM ANOTHER STAR. The science fictional elements involve lots of wavehandium and some of it isn't fleshed out in a satisfying way. Therefore, hard SF fans and viewers for whom plausibility is important should adjust their expectations going into it. The romance is primarily one of soul mates and star-crossed lovers (heh!) who are Beautiful People. (Indeed, all the characters are marvelous eye candy.) The "opposites attract" factor is the source of both comedy and conflict. The central tension of the romance involves Do Min Joon's imminent return to his planet. Some viewers will swoon at the unabashedly romantic tone while others might find it too saccharine. If you like the rescue fantasy in romance, you will *adore* this show. Cheon Song Yi has got to be the ultimate damsel in distress. Do Min Joon rescues her in various ways throughout the series (he's also extremely rich). Though I don't enjoy that trope, I decided to grin and bear it for the sake of exploring a new SFR angle. Luckily, the show had many other things going for it. So yeah, over the top would describe Do Min Joon's heroic interventions at times. And yet I still marveled at how cool all the shots were, especially when Do Min Joon would leap to the rescue. I think it worked because he comes across as very human rather than a more obviously extraordinary superhero such as Iron Man. It's risky for Do Min Joon to break out his powers, so it means more when he sprints into action. On the plus side, the show acknowledged how extreme the damsel-in-distress thread was getting, especially since certain plot points were used repeatedly. Cheon Song Yi's mother expressed as much in a meta comment, which I will of course not spoil for you! Comedic moments also tempered the relentless heroine-in-peril aspect. 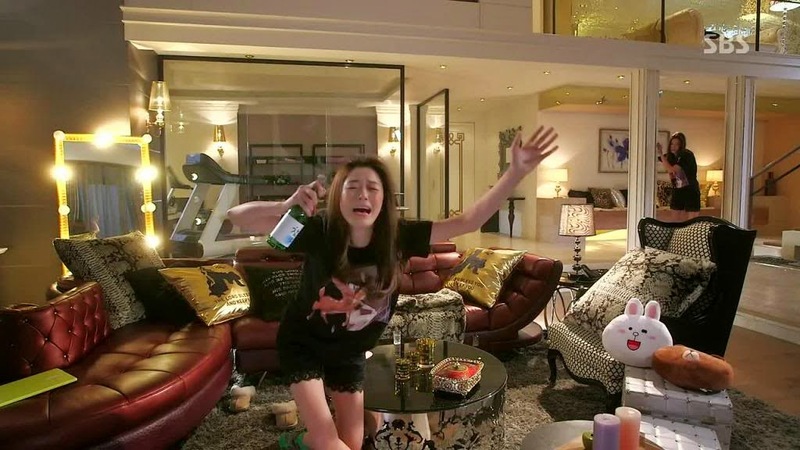 One could argue that Cheon Song Yi helps rescue Do Min Joon on an emotional level. He's got a seriously thick shell around him and she intends to crack it open. When he smiles or expresses other emotions, it feels like a triumph for Cheon Song Yi as well as a super special moment. MY LOVE FROM ANOTHER STAR is for viewers who like "sweet" heat level romances and lots of angst. It's very chaste and innocent (perhaps because it's a mainstream television show most likely geared toward adolescents/young adults?). So chaste, in fact, that whenever there was a scene of Cheon Song Yi and Do Min Joon cuddling in bed, they were fully clothed. The show also presents a convenient reason to keep the heat level sweet and unthreatening--Do Min Joon can't have physical contact with humans (for reasons I won't spoil). While I often enjoy steamy SFRs, I found the chaste aspect a bonus because it allowed the show to develop the romance in other ways. This isn't a show one watches for the love scenes, anyway. I suspect it's more for the numerous scenes featuring Cheon Song Yi and Do Min Joon gazing into each other's eyes! There's a suspense/police procedural subplot in the show. Basically, Do Min Joon's presence creates a ripple effect in Cheon Song Yi's life as well as in the lives of her friends and family. His special abilities plays a role (in other words, if his alien status were taken away, the story would fall apart). 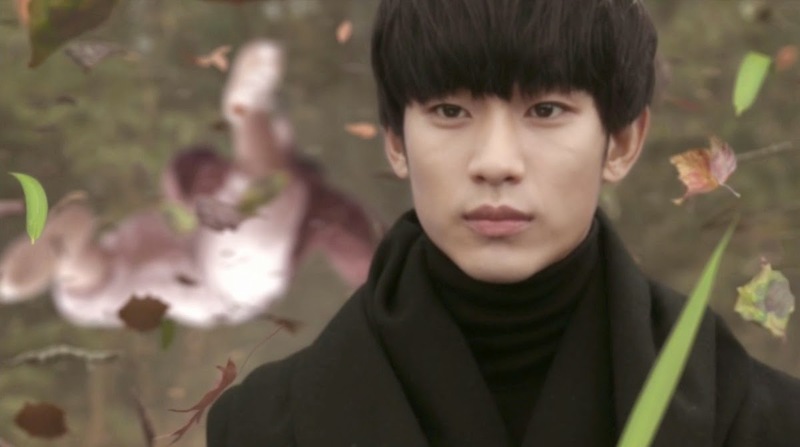 Additionally, flashbacks help fill in the story of Do Min Joon's time on Earth. The layers of his life in different historical time periods are gradually peeled back. I really enjoyed this part of the show. The flashbacks lent the show an epic/saga type feel. There's also a love triangle subplot. As I stated above, Do Min Joon is a combination of Superman and Spock. His character is at once both derivative and original. Makes me wonder why no one's done this combination before! Do Min Joon is the ultimate Beta hero. He's smart, bookish, and an introvert. But he's also a grumpy, reluctant hero. Living on Earth for 400 years exacted a toll on his personality and heart. 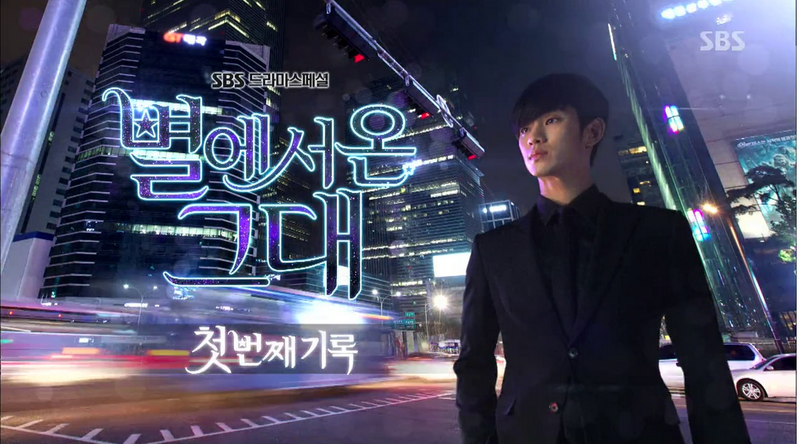 Do Min Joon is a fun hero, but he has a frustrating lack of background. Even though the origins of Superman's powers are very simplistic, at least there's a clear explanation. Unless something was lost in translation (the subbing on DramaFever wasn't perfect), I never learned why Do Min Joon had powers (for reasons other than being an alien) or if they worked differently on Earth than on his home planet. I was hoping for just a bit more depth there. 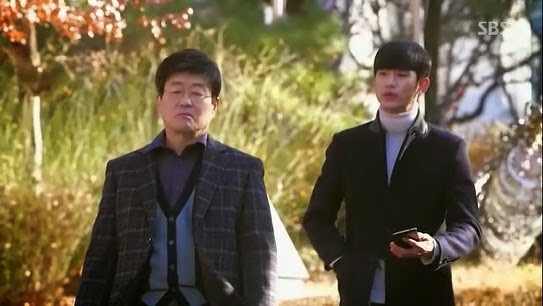 Do Min Joon occasionally infantilizes Cheon Song Yi, which annoyed me greatly. I guess he was supposed to be still protecting her? This happened several times even though Cheon Song Yi had clearly earned the right to know certain things about him and/or was obviously mature enough to handle distressing information. I'm not sure if that's a K-drama romance hero thing, but I've certainly come across it in romance. Obviously, I'm not the target audience for that particular element. Cheon Song Yi is a diva with a heart of gold. She's an A-List actress at the top of her game when the story begins. Her world is all about the glamour and fame. She's a prickly character, which might irritate some viewers, but I was glad she wasn't presented as instantly sympathetic/likeable. She was clearly being set up for a growth arc. Despite a major setback, Cheon Song Yi never quite loses her privileged, moneyed status. On one level, I kept thinking, "Aww, she's having poor little rich girl problems." Again, I'm probably not the exact target audience for this show, and I understand that in the end it's all about the fantasy. The comedic aspect helped ground her character and made her relatable. In addition to being funny, Cheon Song Yi has a conscience. She's not evil arrogant, just clueless arrogant. The circumstances leading to her fame also contributed toward trapping her in that fame, to the point where she didn't know anything else. I can't help but wonder if this show's subtext was you can have fame and fortune or you can have love, but not both. As a couple, Cheon Song Yi and Do Min Joon have good chemistry, in large part because the show tells us they're destined to be together. :) A few montages helped develop the romance, but there were enough scenes of them talking and learning about each other to convince me they were building a relationship. While some secondary characters had more depth than others, they were all an immense treat. I enjoyed the supporting characters as much as the primary ones. There are many, so I encourage you to just check out the show--it's worth it for the other characters alone! I'll highlight two of my favorites. 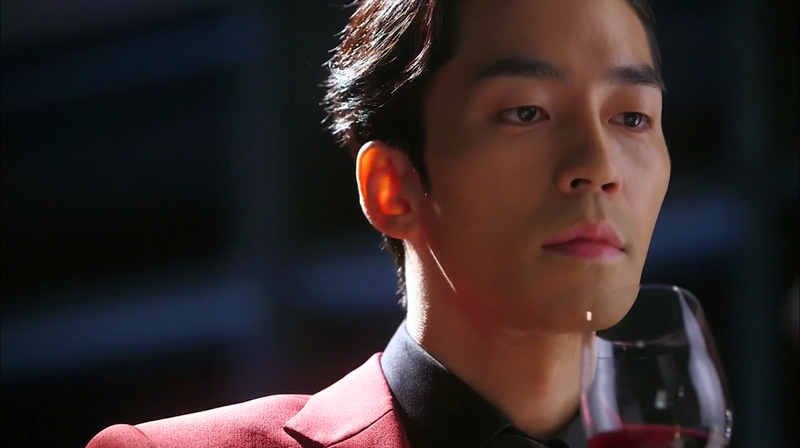 The villain, Lee Jae-Kyung (Seong-rok Sin) is deliciously over the top. I loved how the actor interpreted the character. His performance is very suave, especially when he switches his expression from warm and friendly to devious and evil. OMG it's so creepy-cool! And Lee Jae-Kyung's face-off with Do Min Joon is pure awesomesauce. Do Min Joon has a longtime friend and lawyer, Jang Young-mok, and I actually engaged emotionally with their friendship a little bit more than the main romance. I think it's a combination of the role itself as well as the actor playing the part (Chang-wan Kim). He is superb. I began this show without a clue as to whether there'd be an HEA or even an HFN. And if the show had ended with episode 20 as originally planned, I would have tagged this series as romantic SF with a bittersweet ending. Apparently, fans of the show demanded an ending with better closure and so the "bonus" episode ties up loose ends and delivers a solid HEA. Plus, there's a fanservice epilogue you can watch on YouTube (English sub) that makes the romance feel even more complete. It's extreme, but also pretty righteous. The cinematography is impressive, as is the catchy music. The show is well-acted overall. Special effects are okay, and unfortunately hokey in several scenes. However, some of them were better than I expected. All said and done, it's a pretty, sparkly show! I wonder if someone is going to purchase the rights for a U.S. version of this show. Wouldn't surprise me. I'm not sure how well it would translate, though. Are general U.S. young adult/adult audiences ready for extreme romances of this type? Plus, a huge reason behind my interest in MY LOVE FROM ANOTHER STAR is the fact that it's a non-Western show. In fact, I would love to see more books, shows, and films explore this type of diversity (i.e., PoC humanoid aliens). But if someone wants to create a Western version, I'll watch it! You can tell how much I enjoyed MY LOVE FROM ANOTHER STAR based on the length of this post, yes?! I was excited to discover SFR in an unexpected place. It's an interesting show to explore and analyze.